NOVEMBER 18, 2003--With sheriff's investigators today executing a search warrant at Michael Jackson's Neverland Ranch--reportedly in connection with charges made by a 12-year-old boy--attention will again turn to the original allegations of child abuse leveled against the pop star. At left you'll find the bombshell court document that first raised allegations that the singer, now 45, was involved in inappropriate behavior with a young boy. The December 1993 declaration was sworn by a 13-year-old California boy who sued Jackson for, among other things, sexual battery, willful misconduct, and emotional distress. The child's declaration includes a graphic account of alleged sexual encounters with Jackson at Neverland and various hotels. Four months after the Los Angeles Superior Court lawsuit was filed, the two sides announced that the matter had been settled, though terms were not disclosed. News reports have estimated that Jackson paid between $15 and $40 million to settle the tawdry action. No criminal charges were ever filed in connection with the teenager's charges. In a BBC documentary that aired earlier this year, Jackson admitted, "I have slept in a bed with many children," but added, "When you say 'bed,' you're thinking sexual. It's not sexual, we're going to sleep. I tuck them in...It's very charming, it's very sweet." 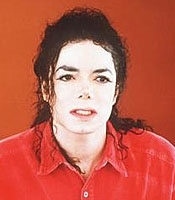 After TSG first published the document on February 6, 2003, Jackson issued a statement noting that he "has respected the obligation of confidentiality imposed on all the parties to the prior proceedings, yet someone has chosen to violate that confidentiality" and use the boy's statements to "further sully" the star's character.